This is one of the many rare Japanese prints in the Museum's renowned John Chandler Bancroft Collection. It is the only complete impression of the first single-sheet print by Kiyonobu, the founder of the Torii school, which specialized in depictions of the Kabuki theater. Kiyonobu arrived in Edo (modern Tokyo) from Osaka in 1687 with his Kabuki-actor father and began to issue books, prints, and Kabuki signboards in the 1690s. As pictures of real actors in performance were introduced by Kiyonobu, such prints became a Torii school trademark. This large sheet depicts the star onnagata (male actor of female roles) in the play Kanto Koroku. In the role of Tsuyu no Mae, the actor is performing a kyoran (lunatic dance) before the Tadasu Shrine. 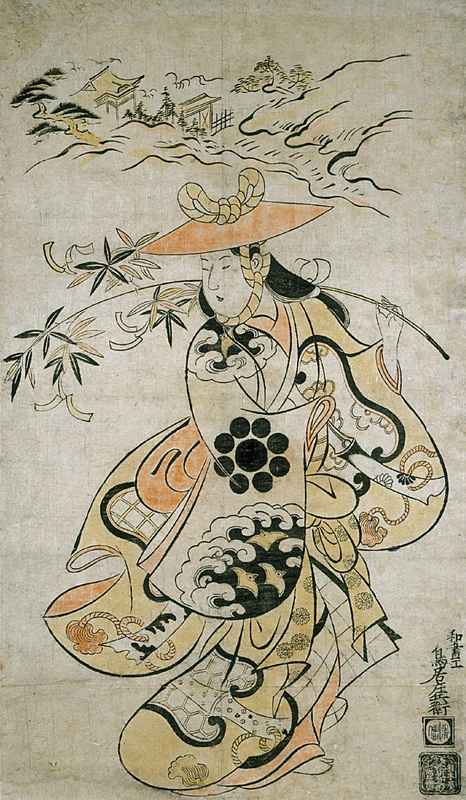 The fluid contours and rounded forms echo the movements of the elegant wagoto (soft-stuff) style of Kyoto-Osaka (Kansai) Kabuki, which Kiyonobu knew through his father.